Zelda fan's were in for a treat when they checked Sakurai's daily Smash Bros screenshot. A familiar face popped up on Super Smash Bros Game Director Masahiro Sakurai's "screenshot of the day" thread on Nintendo's Miiverse social network. 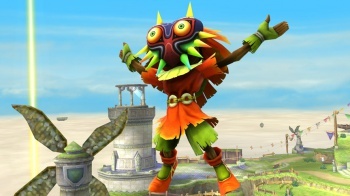 "Here's a new Assist Trophy--the Skull Kid!" announced Sakurai in a message accompanying the post. Zelda fans will recognize the child, who appeared in The Ocarina of Time, Majora's Mask, and Twilight Princess, as the poor guy who's appearance was altered after getting lost in the lost wood. "I repeat, it's an Assist Trophy, not a new fighter," stressed Sakurai. "The characters announced on the website are the fighters!" Even so, Zelda character's have been getting a lot of love for this game, with both versions of Link being confirmed, as well as several new Zelda-themed stages. The fate of Gannondorf and Princess Zelda herself, who were playable characters in Super Smash Bros. Brawl, is still unknown. For those of you unfamiliar with how an assist trophy works, it's basically a Pokeball for characters that aren't Pokemon. When the items appears, whoever picks it up first will summon a random character to come and fight for them for a short period of time. In Brawl, assist trophies contained characters such as the Shadow the Hedgehog, Waluigi, Tingle, and Gray Fox. Skull Kid is the first confirmed assist trophy for the new game. Most recently, Marth from Fire Emblem was confirmed to be a returning character. The latest "new" fighter revealed was the Wii Fit Trainer.